We met on Friday at Kings Road and Mottingham and after the usual briefing and filling of tanks we set off in sunshine and made good time. At the rendezvous point of the Hog’s Back car-park, it was agreed that it was such a nice day we’d go down the old A30 rather than the planned A303 and as this is a route I know well no navigation aids were required. With Nick Franklin bringing up the rear our convoy of 8 motorcycles proceeded south-westerly at a steady plod of 65/70 mph along the leafy A31, through Winchester, then along the B3049 to Stockbridge. Picking up the A30 we then blatted down to Salisbury (for a petrol stop) and through Wilton (home of the eponymous carpet) to Shaftesbury where we stopped at the Half-Moon for lunch. Suitably refreshed it was through to Yeovil and then up onto the A303 for the last three lane section prior to the Taunton turn off and then A358/A39 as far as Minehead, arriving at 4pm. Good going for an unhurried 190 miles. Booking in was followed by food and drink and a chance to enjoy the varying entertainment as well as meeting up with old friends. There were two concert venues as well as a comedy club, so together with some traditional bars and a cinema there was something for everyone. Being 4th July the evening had to include fireworks and they were awesome if a little erratic! I thought the display area was a bit close to the spectators, a view reinforced when things started whizzing over one’s head. Saturday started off sunny and warm but unfortunately this didn’t last. C&F and Meridian Chapter members had volunteered to help with the marshalling and safety aspects of the Craig Jones stunt display and the ride-in custom bike show. 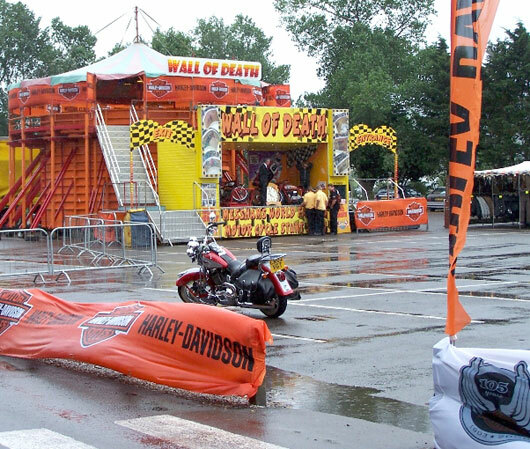 We weren’t on-duty until 1pm so after a leisurely breakfast, Smiley and I went to see the Wall of Death. Now they really are bonkers. Ride a motorcycle round a 10 metre diameter wooden cylinder, and once the speed is up to that necessary for centripetal force to overcome gravity, ride it up the wall and do tricks. The invitation from the compère to contribute to the rider’s injury fund was met with a shower of coins and notes. We know about gravel rash and they had splinters added! So after a quick lunch it was off to see Craig Jones for the marshal’s briefing. Unfortunately the wind and rain were now extremely enthusiastic and it was difficult to see what sort of a show could be put on in these conditions. Still Craig is both a showman and large on cojones and in the end he was quite fantastic. Wheelies, stoppies, burnouts and doughnuts on a Buell in howling wind and torrential rain were quite phenomenal - and then he went and got the Dyna... my God, 1750cc of barely controllable Milwaukee grunt in 45 degree rain and Force 8 wind. The power slides were both spectacular and for us marshals uncomfortably close; no photos as my camera is not waterproof, but he even tried wheelying the beast. After about 30 minutes of genuinely death defying action he called a halt but not before the spectators went away with a whole new image of what grip is actually available in poor weather conditions (if you’ve got his talent and bravery!) Yes, I was impressed and hope to see the whole show at a later date. The drag bikes simply couldn’t run in the conditions, so the rest of the afternoon was set aside for the Rider’s Edge and Craig Jones Academies. Now that was an eye-opener. 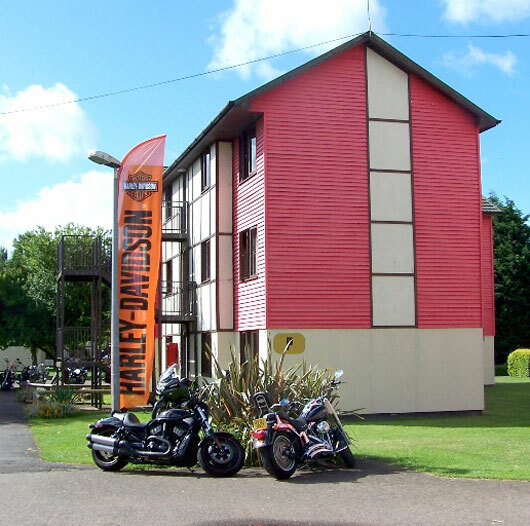 Seeing Harley Sportsters being cornered in the wet in nice smooth circles with the footpegs scraping, and C&F members being prepared to pit themselves on their own bikes against the manoeuvring course, was most excellent. Scottie proved to all watchers that he possesses the skills to justify his senior road captain status by completing the obstacle course against the clock in 42 seconds dead, a time only narrowly beaten by one other competitor (Clifford from HD-Europe). 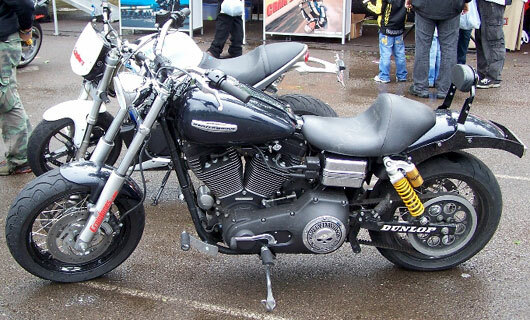 I make no apology for bowing out at the ‘Sportster round the cones stage” ’cos there was no way I was going to risk myself and the trusty Softail in those conditions. Gavin and Janet Jones were both very impressive, especially the two-up run around the cones on Gavin’s DeLuxe with Janet showing great body movement at the rear. Note to self - really must brush up on the low-speed manoeuvring skills. A halt was called at 6.30pm as the light had started to go, and the rain was unrelenting. Everyone who had spent the day outdoors was soaked. Saturday night was a repeat of Friday but with different bands and no fireworks. The rain finally stopped at 6am Sunday. And started again at 10.45am just as the Grand Parade was assembling. Two police motorcycles, the local constable, a selection of PCSOs and the Traffic Inspector from Taunton were our resources for the parade, together with about 50 experienced road captains from the various chapters represented. It was entirely trouble free and seemed well received by the populace. The one thing we couldn’t control was the local steam railway but that just added to the spectacle. About 450 bikes took part and I think that we allayed all the fears that the police had had prior to the event so it turned into both fun to do and a good PR exercise, so winners all round. Unfortunately on return to the site we learnt that Craig Jones had in fact hurt his wrist during his abbreviated display on Saturday so the Sunday event could not take place. We wish him a speedy recovery. So not much to do except go home - and to bring the weekend to a fitting end, I had a puncture 2 miles from home. The AA have just left, will need ANOTHER back tyre (#5). Oh well. The ride home was a solo affair so not much overtook me and it didn’t take long and was (mostly) legal but excellently progressive. Little low speed practising however, will still need to make some time for that. Needless to say I got absolutely soaked again and the bike is no longer red but brown. Web design by Saffron © Chelsea & Fulham H.O.G. All rights reserved.